The website for Dr. Paul M. Friedman, a cosmetic dermatologist in Houston and New York, utilizes many popular internet tools with some interesting and unique additions. This easy-to-navigate website is able to display several different navigation pathways without making it appear cluttered, and the flash animation on the homepage gives an inviting and state-of-the-art first impression to visitors. 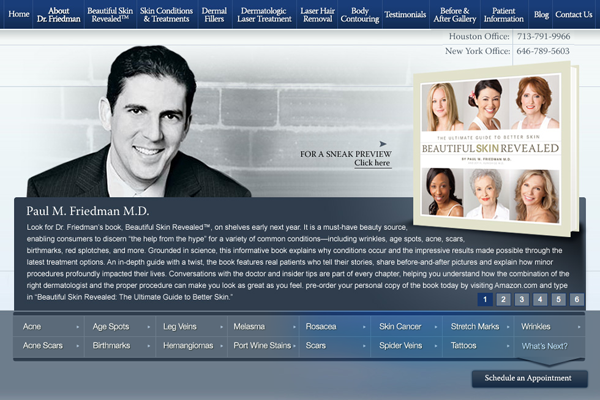 Dr. Friedman’s new website also prominently features a special preview of his new book, Beautiful Skin Revealed – in fact, the preview is designed by our expert team of graphic artists to flip pages like an actual book. The site includes detailed descriptions of skin conditions and procedures available to treat them, as well as web video and TV news segments featuring Dr. Friedman. There are also prominent buttons throughout the site that quickly take visitors to the practice’s FaceBook, YouTube, and Twitter pages, and the entire site’s content is optimized for search engines.